For device displays such as phones, tablets, monitors and televisions, the use of the word resolution as defined above is a misnomer, though common. The term "display resolution" is usually used to mean pixel dimensions, the number of pixels in each dimension (e.g. 1920 × 1080), which does not tell anything about the pixel density of the display on which the image is actually formed: resolution properly refers to the pixel density, the number of pixels per unit distance or area, not total number of pixels. In digital measurement, the display resolution would be given in pixels per inch (PPI). In analog measurement, if the screen is 10 inches high, then the horizontal resolution is measured across a square 10 inches wide. 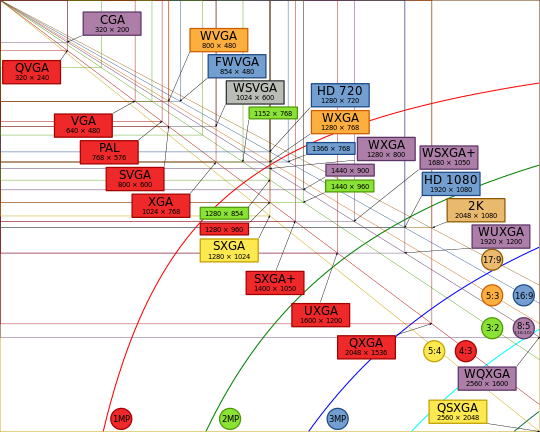 For television standards, this is typically stated as "lines horizontal resolution, per picture height"; for example, analog NTSC TVs can typically display about 340 lines of "per picture height" horizontal resolution from over-the-air sources, which is equivalent to about 440 total lines of actual picture information from left edge to right edge. Below are common display resolutions by international standards.